APGeorge Pataki speaking at the 2012 New York State Republican Convention. Republican former New York Gov. George Pataki said he’s considering running for president in 2016 in an interview with Fox Business host Neil Cavuto that was broadcast on Thursday. Pataki flirting with a potential presidential campaign is something of a quadrennial tradition. He was considered a possible candidate in 2008 and, in 2012, he fuelled speculation with a trip to Iowa, an influential primary state. However, Pataki has never officially made a presidential bid. In his interview with Cavuto, Pataki was asked what he might be able to offer voters in 2016. Pataki, who was governor of New York from 1995 until 2006 cited his experience leading a “big, complex” state. 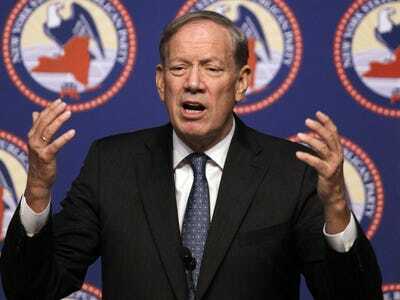 “If I do this, I think it would be — you have to have the right vision for the future of America, the ability to govern successfully,” Pataki said. Despite his jab at Christie, Pataki said it was “too soon” to say how he would differentiate himself from what is expected to be a crowded Republican field in 2016.